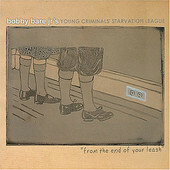 On his latest, From the End of Your Leash, singer-songwriter Bobby Bare Jr. and his Young Criminals' Starvation League deliver a record that is as much folk-rock and roots-influenced as it beckons indie-rock and pop. The melodic "Don't Follow Me (I am Lost)" displays Bare's ability to craft rough-around-the-edges, but still memorable piano-pop grandeur, while "Borrow Your Girl" is whiskey-soaked country-rock, from the vocals through the instrumentation, leaning a lot more on the country side, and light on the rock. And let's not forget "The Terrible Sunrise", Bare's ability to spin a story over folk guitar. Or the honky-tonk of "Visit Me In Music City". Heavier on the country and roots side, Bare knows how to write genuine, tender country songs, but he also knows how to keep things interesting and mixed up, jumping around from sound to sound, while making all uniquely Bare Jr. From the End of Your Leash is a fine representation of this, leaning from indie-rock to country without a second thought. I'll give it a B+.